Saturday evening, March 16th, 2019 felt similar to Saturday, November 3rd, 2018. I had a pasta with protein dinner, drank a ton of water, planned my outfit out for the next morning as well as the layers I would bring with me to the start and organized my race essentials. I set my alarm for 530 in order to leave at 6am. Knowing that the race was half the distance, and literally half the participants, and I was scheduled to start at 7:50am and not close to 11am, I did feel a bit less overwhelmed. Yet it was my first half marathon, and I wanted to take nothing for granted and be as prepared as I could. I was starting in wave 2 of 5; at 7:50am. I was told to get to the start by 6:35am. Good thing I did, as once the cab left me off where I needed to go, I still had a mile walk into Prospect Park to get to the start village where I could fuel and use the bathroom. 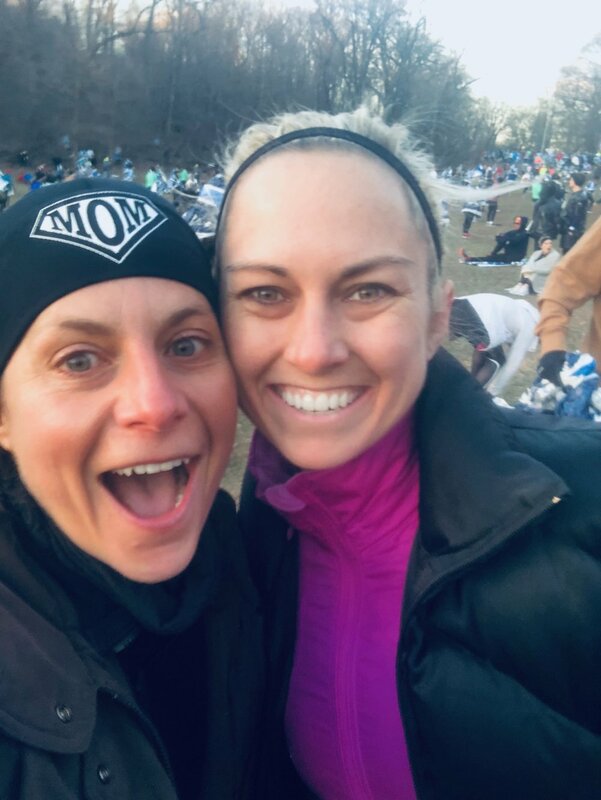 After running into one of my first clients from 2013 when I was teaching the moms in Central Park who became one of my first instructors- out of the 25,000 participants- I made my way into my corral. Fortunately, unlike last marathon, I was in the right wave speed wise, with people who were looking to run between 1:50-2:00. As I had never done a half and didn’t want to get myself too hung up on time, during my training I didn’t have a specific goal but figured I would run it between 1:50-2:00. Marathon #6 last November threw me: I could not find my pacing for the first 5 miles. I had remembered in years past when I had used a Garmin and did not want to do that because with the weaving it often measures the mileage not the way NYRR does. So, when I crossed the start, the official clock was at one hour and change and I couldn’t remember. So I couldn’t truly figure out my pace. While it was not my first rodeo, I made the rookie mistake where, instead of doing my best to go with the flow and run in a straight line to the best of my ability, since I was aiming to run faster than the wave I was in, I was constantly weaving and running around people then slowing down. Big mistake. Don’t do it. For this half marathon, I made three significant changes: first, once at the expo, I got a band that showed the time I needed to be for each mile if I were to run the race in 1:50. I spoke to the 1:50 pacer who told me he was going to take the first few a bit slower. Then, I used a stop watch where I was able to measure my actual elapsed time and compare to the bracelet. This saved me, as I wound up crossing the start line at 8:01 which was 31:40 seconds after the official start and there was no way I could do that math while trying to pace myself throughout the 13.1. The third significant change: I did my very best NOT to weave. If I felt it was a bit crowded, I waited a few seconds to see if I had an open spot directly in front of me and then took that spot. I did my best to edge on the side where the fuel was in case I wanted water. This saved me from running unnecessary miles and from exerting vital energy. During each of my six marathons, at some point the unexpected happened. During the 2017 marathon, unexpected leg cramping started at mile 16, right off the Queensboro and stayed with me for the rest of the race on and off for the next 10.2. During the 2018, when the leg cramps started again around the same time, I started to panic, but as I was much better trained, somehow through just a bit more hydration and taking miles 16-19 a bit slower, I recovered and felt great the final 7.2. During the 2010 marathon, around mile 21 I almost slipped on a banana peel and around mile 24 felt just completely emotionally exhausted and this overwhelming desire and panic to just stop. During the 1998, 2010, 2017 and 2018 Marathon there was a moment where I questioned if I would finish. This did not happen during 2007 New York nor 2015 Houston where I felt great at the end of both. For this half marathon, I had no doubt at all that I would finish. I also knew that, while 13.1 is a challenging distance, 9-10 miles felt okay and, even if I hit a moment where I was uncomfortable, I would remind myself I only had 3-4 more. The uncomfortable part for me during the half was the final push; because it is half the distance, there is no saving yourself. Once hitting mile ten, I considered myself in the home stretch, which meant picking up the pace and running faster on tiring legs. I knew my father was waiting for me between mile 11 and 12, on 57th and 7th, right before the final hilly stretch into Central Park and around 72nd street west. Once I saw him, I was at 1 hour and 40 minutes into my elapsed time. I knew I would break 1:55. Hitting 1:50 would be tight; but why not go for it? Turning on the speed, I did. Yet, as I had no previous experience running a half, I didn’t exactly know how much I could push myself and for how long. The last mile or so was challenging, feeling like an all out sprint at that point even though it was probably not if I was at mile 4 or 5. When I finished, 1 hour 53 minutes and 11 seconds after I started, I knew at that moment I had given all I could. Now that I understand what it feels like to run a half, I know if I want to increase my speed what to do. When my coach told me to “get comfortable in the uncomfortable” that is speed work. And, be confident in my body’s ability to go faster for longer distances. I have signed up for the Shape Women’s Half Marathon just a few weeks out on April 14th. When it’s your first half, like it was, it is always your PR and mine stands at 1:53:11. Will I PR on April 14th?